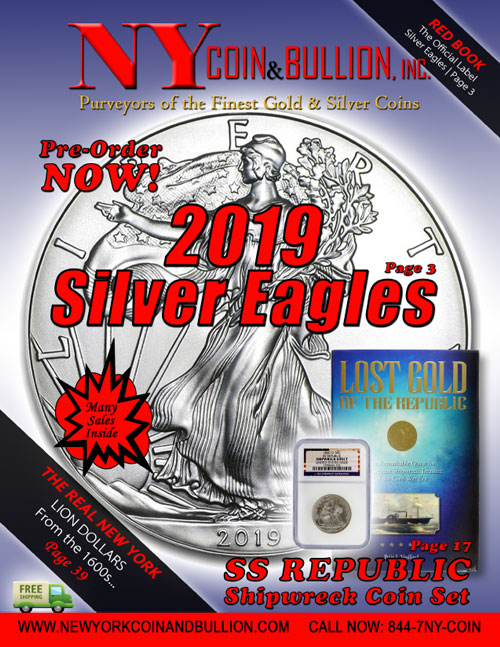 Free Domestic Shipping: Currently New York Coin and Bullion, Inc. offers free shipping on all domestic orders in the continental U.S. Affordable rates for shipping are available for areas outside the continental U.S. Terms and Conditions of Sale: Title to the merchandise described on this invoice does not pass until paid for in full. The buyer may return coins for any reason within 15 business dates for receipt for a full refund. After the 15-day return period has passed, all sales become final and no returns will be accepted. Coins certified by PCGS, NGC, ANACS, ICG, etc. carry a 3-day return policy, after which all sales are final. All returns must be via registered mail, insured for the full invoice amount. Risk of loss is on the buyer. Unless otherwise stated on this invoice, payment is due upon receipt. Any account in arrears 30 days will receive a 1-1/2% late charge per month from the original due date. In the event an account goes to collection for non-payment, the buyer is liable for any additional late charges and fees, including the cost of collection. All disputes will be resolved in New York State, Suffolk County Courts, and are subject to the laws of New York State. Coin Grading: Grading is subjective and as such is subject to the opinion of the grader(s). Standards can and do vary from dealer to dealer, grading service to grading service and expert to expert. Due to these inherent inconsistencies and the subjective nature of the coin grading process, New York Coin and Bullion, Inc. cannot represent that a particular coin grading meets the standards of any third party grading service. Risk Disclosure: The purchase of coins and collectables involves risk. Unlike bullion coins where value is determined by the spot price of its precious metal content, the value of a numismatic coin lies in large part to its perceived scarcity and quality which can and does fluctuate independently of bullion prices. New York Coin and Bullion, Inc., its principles and representatives in no way guarantee profit or guarantee against loss of any rare coin purchase. The numismatic coins sold by New York Coin and Bullion, Inc. are strictly for collectors. The value of such items may be only in their beauty and history and should not be considered an investment vehicle.